When I heard about the Fairy Hobmother over at Jenna’s blog, I sort of didn’t believe it. You have to admit, the concept sounds too ridiculously good to be true–basically, you just contact the Fairy Hobmother, ask for an appliance you’d like for your kitchen, and then receive it, free of charge. When Jenna told me about it, I thought, “Whaaa?” Nothing is free any more, right? But it turns out, I’m more greedy than I am skeptical, so I took Jenna’s advice and contacted her, and Viola! This is what she sent me! Now readers, don’t worry. I’m not going to pull a Gwyneth and go on regular juice cleanses. I’ll never be hard-core health nut; this girl needs her cheese and her warm baguette. However, with the *shudder* holidays approaching…4 weeks until Thanksgiving food coma, yo…I don’t think it would be a bad idea to have a juicy breakfast or lunch now and then, do you? Plus, freshly equipped with my new toy, I can now make Mama all kinds of bug juice to tote home in a happy container, plop in the refrigerator, and threaten Daddy-o with. This tickles me to no end. I was shocked to see how much juice this juicer has. As in power. I watched my shiny contraption gobble and pulverize cruciferous things like apples, carrots and celery in no time at all. Seriously, it took about two seconds for my little cocktail to materialize. I love immediate gratification like that. For my maiden voyage into juicing, I chose a fairly simple combination of ingredients. I’m not quite ready to tackle the concoctions using beets or parsley or fennel, but knowing my fascination with the odd and the weird, I’ll probably be trying those soon. Well, okay, maybe not the recipes using fennel–my nemesis–but some of the other recipes. I peeled the orange (citrus fruits need to be peeled before going into the juicer) but left the pretty red skins on the apples, and I didn’t need to peel the carrots, either. I just gave them a good scrub, and in they went. Next time, if I’m feeling patient, I might skim the frothy layer of foam that rose to the top, but it didn’t really make a difference outside of aesthetics. And guess what? My concoction was darn tasty! It was sweet enough that it didn’t need honey or any additional sugar. It even yielded enough to serve two people, so I stashed the remaining juice for the next morning. I have to say, dear readers, I think I’m a fan. Don’t tell Gwyneth, though. I don’t want her schlepping her scrawny arse over to my house, bags of tofu dogs and soy bacon in hand. But the occasional juice fest? I’m in. Yeah for fairy godmothers that deliver appliances…and for the juicy goodness that you can send home with your Momma. Hooray for juicing! I love my juicer and couldn’t do without it. When you have some aggression to get out there is nothing better than whacking into a young coconut for the fresh coconut water to mix in with juice. I’ve found that carrot juice + ginger juice = a whole lotta energy. ps: Whenever I think of fresh coconut–whacking through one–I think of you and your summer visit! Ok, I’m going to go visit her too. This sounds yummy. Please don’t go all Gwyneth on us!!! You got an appliance. For free. I kind of got stuck on that a whole first part. But I am glad that you enjoyed your juice. I’ll pass her info along to you! Seriously, free appliances??? My breville juicer needs a new part and I miss my juice!! Yours looks divine. Try 1 beet, 1 or 2 oranges and 2 carrots. So sweet you’ll think you’re drinking liquid Pez. Your mama will love this!!!!!!!!!! I’m definitely a fan of the juicer. However, I hardly ever use it because it makes quite the mess and I’m as lazy as they come. That said, I’m sipping fresh-squeezed loved vicariously through you. Smooches! The one she sent me was pretty dang easy to clean–I was pleasantly surprised! Yay for the new juicer. 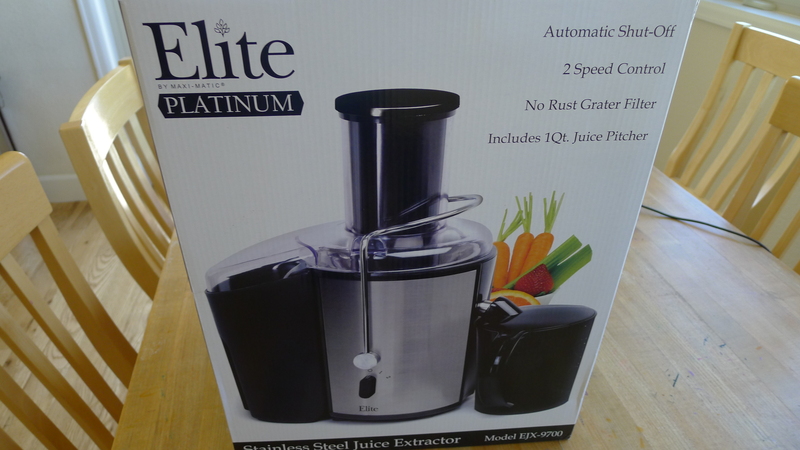 I tried it years ago, but it was a crappy cheap juicer…may it’s time to try again with an upgraded version! Don’t worry I won’t tell Gwyneth… She sems to be a bit of a odd duck. Your first venture into Juicing sems to be a sucess! I may have to look into the Fairy Hobmother thing. I’ll be emailing her info to you! I’ll contact you, too, with Fairy’s email! It is a sad, sad business, soy bacon. No kidding! That post of yours about the avocado cutter cracked me up! Ok – jealous of the juicer… seriously want one – on my Christmas list this year. And…. 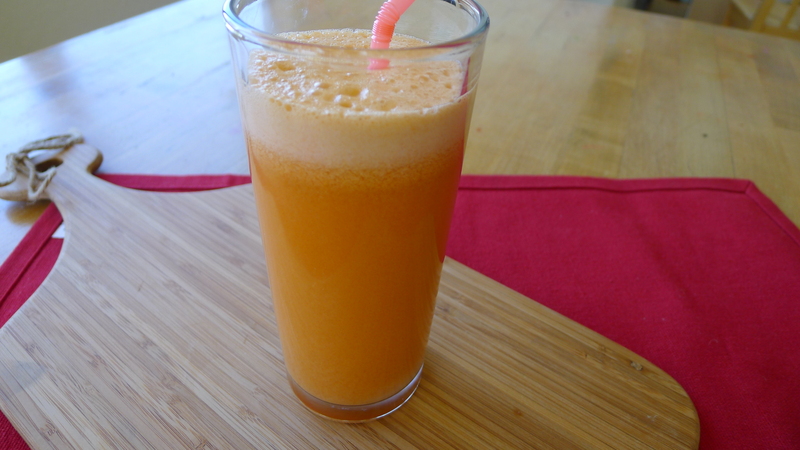 this is one of may all-time favorite drinks … though I do another variation too – apple, carrot, orange, ginger…..
Ah yes, the juicer. Ours is collecting dust. 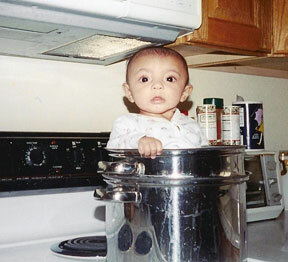 My husband went on a juicing kick at a time when I was juggling two infants. Seemed like much to much work for me. But this delicious concoction is nudging me to dust it off. Speaking of Gwenyth…….Have you tried Veganaise? She swears by it. And a blind taste test on a show I love (Anna & Kristina’s Grocery Bag) had the average jane choosing it over regular Mayo. We love it in this house! Veganaise? Gulp. Just the sound of it makes me feel all Gwyneth-i-fied. You like it? Seriously? Damn. Now I’m curious. 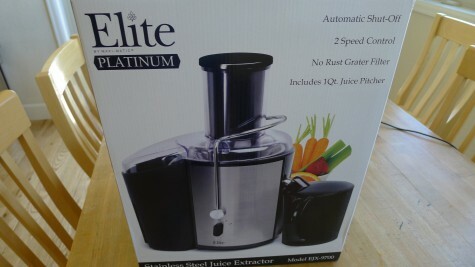 Free juicer?! I’ve always wanted a juicer. If I had juice for breakfast and lunch I might have a chance of losing the last of my baby weight. Seriously, it’s been 7 months and I’m still 20 pounds up. Ugh. Fairy Hobmother? I’d like to meet her! Could you send her my way? I can’t say I’ve ever “juiced.” Go figure. I’m now feeling a hankering for a contraption and something comfortingly orange. And I don’t mean pumpkin pie. Wow – great looking juice!! yay for juicing and yay for the Fairy Hobmother!! Damn, damn, I got an email from Fairy Hobmother and I ignored it because I did not know what to think about it-sounded too good. A fresh glass of whole juice has a way of putting a pep in your step. This looks delightfully delicious. 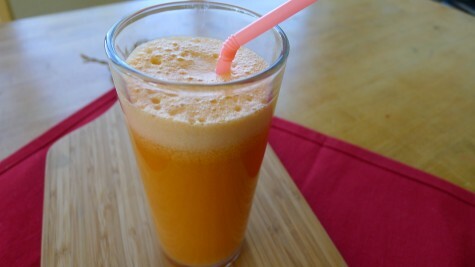 Would your mama enjoy juice this way (low acidic version)? It’s never too late! I can give you her email address if you’d like! Wish I could think of something that would make my sister’s life easier. With her dud kidneys, she can’t have anything concentrated, so no juices. She’s also gluten intolerant, so nothing for baking. What other appliances are there? Maybe something that cooks chicken in a hurry? She pretty much exists off chicken, rice, and low-potassium/low-phosphorous vegetables. It’s not a good life for a foodie! I have to say it sounds to good to be true and yet there it is?! Your mum will love the new juices you will be rustling up for her, maybe you can sneak some veggies into the girls without to much pain? That’s a great idea. The juice you made sounds delicious. It’s quite a thrill to take all natural fruit with no added sweeteners and make a deliciously sweet drink. I’ve never owned an actual juicer, though. I’m still at the blend stage of development. Nice post! Please, oh please don’t turn into a juice-it-all freak! Everything in moderation ;) I do love a good juice, especially when mixed with a good liquor! I emailed you but please do send the Fairy Hobmother my way! Mama needs a new stand mixer for Christmas cookies!!! I could use a super powered blender (like a blendtec or vitamix). Would asking for a new fridge be too greedy? I like the frothy layer – looks pretty. As chance would have it – and you might already know that I stumbled into the world of blogging via the foodie route (as opposed to the mommy blogger route) – and I read a post that would match nicely with your new toy. A book of smoothies, juices and soups – by bloggers in support of a good cause. Anyway, might give you some fab ideas. Wow! You certainly make a good case. But I don’t like to drink my calories. They go down way too fast before I can enjoy them properly. Perhaps I will store this idea in the same place you store homemade yogurt. LOL. P.S. Making it for your Mom does sound like a wonderful idea though. Now that sounds yummy. I’m totally on a smoothie at breakfast kick. I figure I get at least 2 servings of fruit right from the beginning. I’ll admit I *have* to eat something else with it. I need all the energy I can get. I am just visiting here from Jennifer @ Momma Made It Look Easy’s recommendation. The Fairy Hobmother sounds like the perfect friend for a Kitchen Witch. I am still thinking of what appliance I might need. If I come up with something, how do I contact her? I just like the valuable info you provide to your articles. I’ll bookmark your weblog and test once more right here regularly. I’m somewhat certain I’ll be told many new stuff proper here! Best of luck for the next! Hi there very nice website!! Guy .. Beautiful .. Wonderful .. I’ll bookmark your blog and take the feeds additionally?I am glad to seek out so many helpful info right here within the publish, we need develop extra strategies on this regard, thanks for sharing. . . . . . Magnificent site. Plenty of helpful info here. I am sending it to several buddies ans also sharing in delicious. And of course, thank you for your effort! BEACtq Very informative article post.Really thank you! Want more.